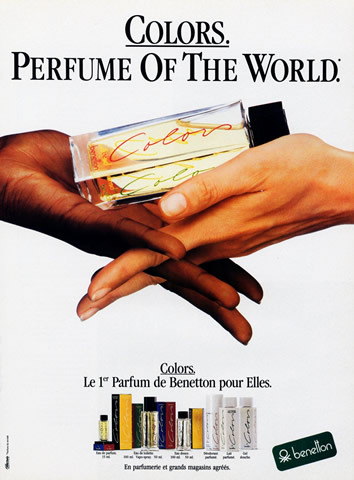 I went back to look for the stuff I used to wear in my late teens: Colors de Benetton (my mom bought me the entire range of products), and the first perfume I remember buying for myself, Paloma Picasso Mon Parfum. I still love it dearly (at least in original extrait). 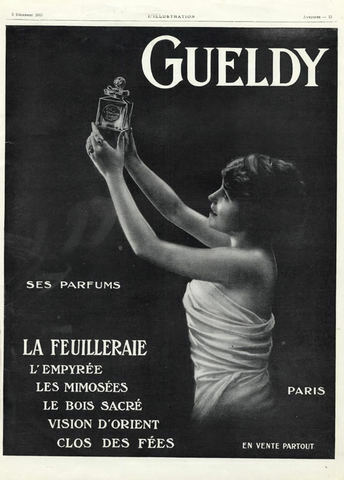 I'd love to have a book that collects Guerlain ads. 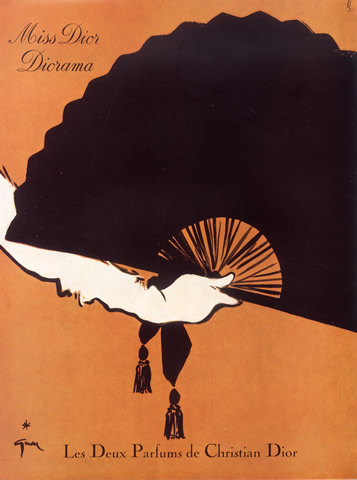 Shalimar alone has probably enough material for one, from the 1929 piece onward. 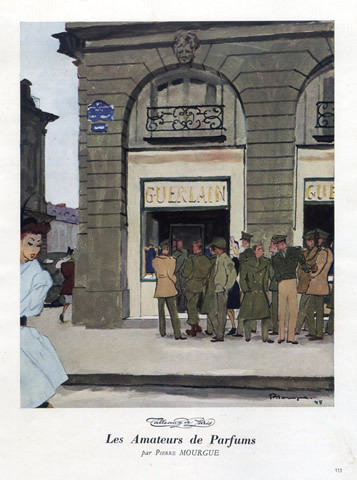 Then there was the 1945 advert, depicting American soldiers standing in line to buy Guerlain perfumes for their beloveds at home. I'm not sure what to think of it, but it is a piece of history. 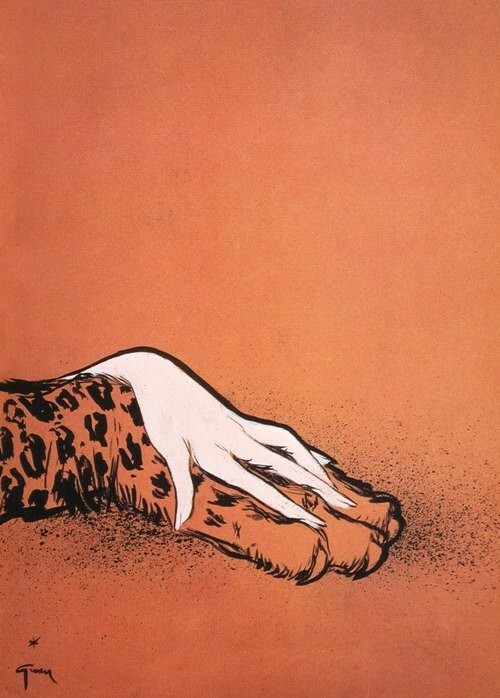 I adore that ad with the tiger paw. I often get lost for hours looking at old ads. Thanks for sharing these treasures! 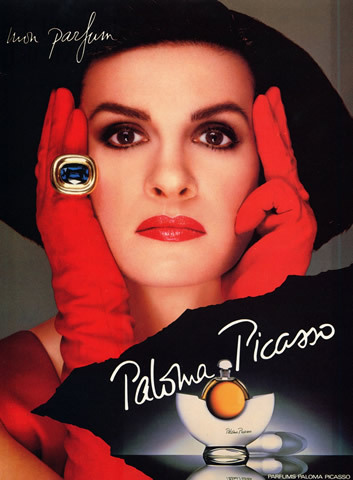 Love the Paloma Picasso ad --- so strong!!! Love these, they are so evocative. The last picture features Les Amoureux de Peynet. Love the adds, especially the Cuir ones. 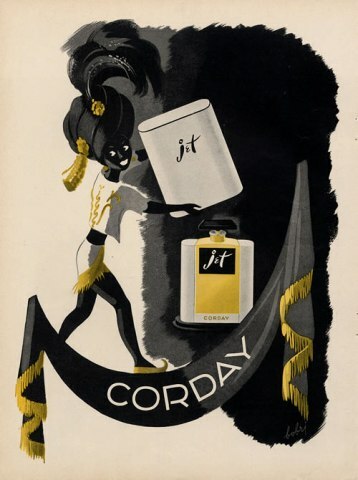 Looking at these I was reminded that somebody kindly send me a sample of vintage Corday Jet, I don't think I tried it at the time ( there's always so many other things), but will have to go and find it asap. you should write a book on them. i'm sure it'd be fabulous and lots of people would enjoy it. 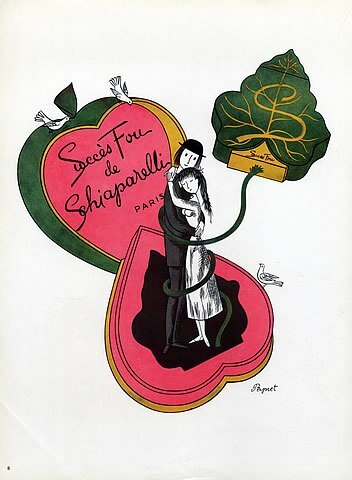 I love vintage perfume ads-whether in print or video, I find they are so whimsical-they portray a sense of art, seduction and intrigue; something today's ads are much lacking. 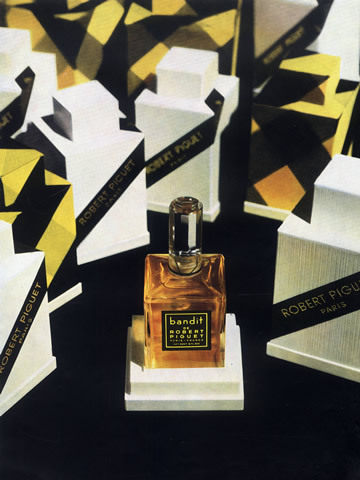 I recently purchased a copy of L'Esprit Serge Lutens: The Spirit of Beauty. It's clear his makeup, costumes and photo styling concepts are so far ahead of their time, even by today's standards. He is a genius in so many ways! 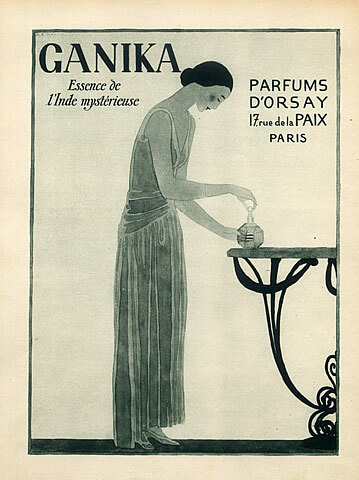 I adore vintage perfume ads! I have collected some old Chanel and Guerlain from the 20s-70s and have framed them for my bedroom wall collage. 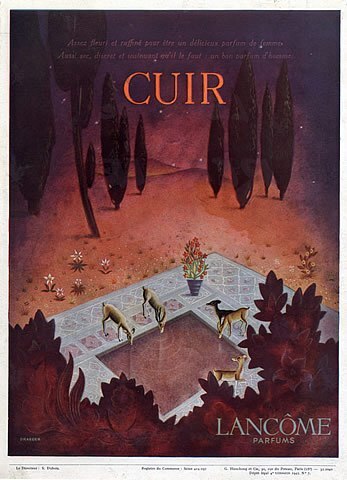 Luckily, the DH doesn't mind... My favorite is the Maxfield Parrish -like one for Guerlain. Hprints is fantastic for whiling a way the odd hour or four! 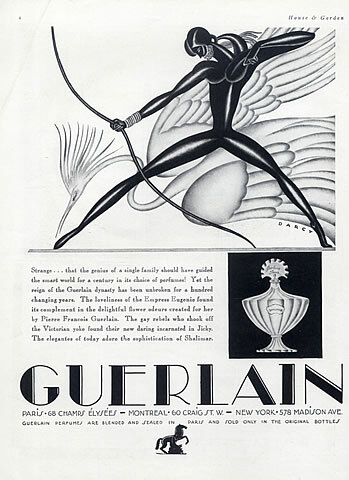 Funnily enough, I've generally never cared for Guerlain's ads. 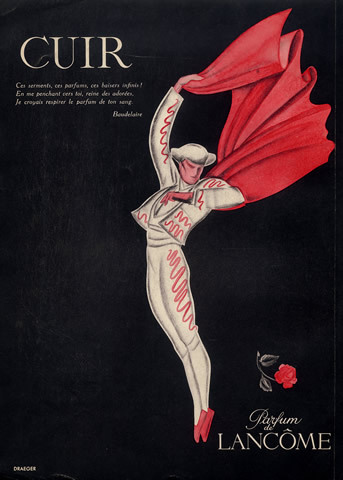 There are some good ones but other companies seem to employ better artists: Dior, Lelong, Schiaparelli, Lancome, Coty and Lanvin in particular. However, I'm glad you included the one of the soldiers queueing to buy Guerlain. Chanel makes a huge big deal of soldiers queueing to buy Chanel No 5 to send home, but the exact same thing was happening at Guerlain. I second the idea of you doing a book on this. I think it would be fantastic! 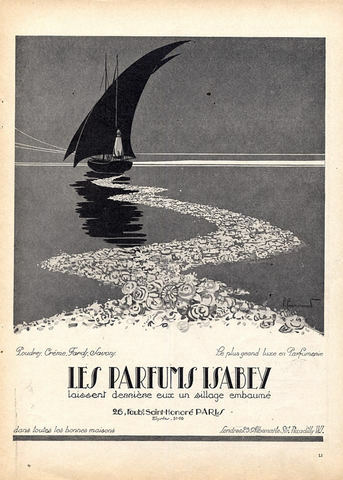 I always love the ads you show when you review a vintage perfume, and a book would just be an expansion of that. Christies has a Gruau auction on September 24. Am eagerly anticipating the online catalogue. So funny that the Benetton is "vintage"--I guess that means I am, too. I remember when the brand seemed SO modern. And yes, do write a book on this subject--it would be wonderful.